How does using IB save heaps on transaction costs compared to DEGIRO. I understand one could prefer IB to DEGIRO for many valid reasons, but fees are really not one of those, or am I missing something? 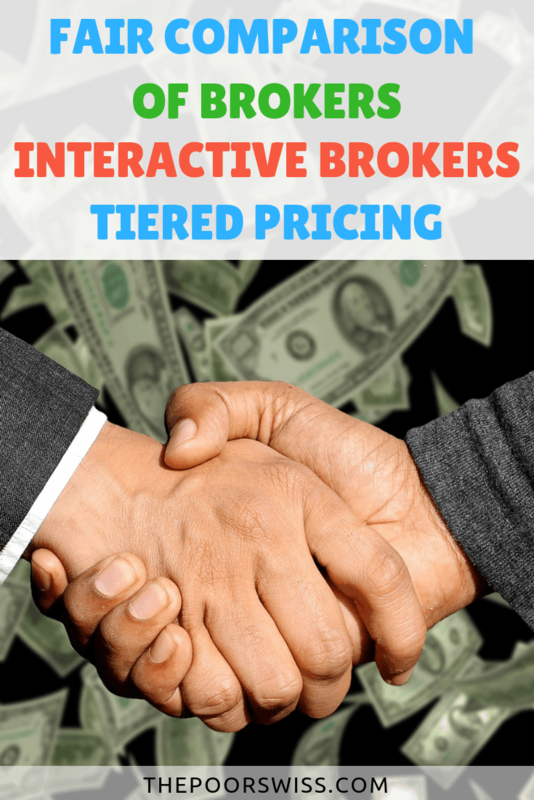 Complete comparison of DEGIRO and Interactive Brokers, including the Tiered pricing of Interactive Brokers. Find out what's the cheapest broker. I’ve heard there will be a way to buy US ETF anyway, even after 2020, but I still have to investigate how. There is one. It was mentioned by @hedgehog. You need to be considered a professional investor to be able to opt out from the regulations. It is basically a loophole for the rich. And how will that work? Who will evaluate if I have enough experience? How will IB know in order to allow it? I worked for banks since 8 years, is that enough? Also if I was a janitor? Will that also classify me as professional investor and trigger capital gains tax? because then it’s easier, and probably cheaper, to just buy VWRL. I do not know more unfortunately. Well being qualified as professional investor is not so bad in the accumulation phase. You will never have any capital gain to tax theoretically. From what I’ve heard, the “Professional Trader” and “Qualified Professional” are two distinct concepts and have nothing to do with eachother. You won’t pay more taxes. I did some research at some point, and I don’t think it is supposed to force IB to prevent you to trade those. My understanding is that the requirement applies only to financial products marketed (offering) to retail investors. Art. 3 lit. h FinSA cannot include the acquisition of units at the instigation of or at the own initiative of the investor. So if you just want to trade it, it should still be allowed (reverse solicitation). I also remember checking some parliamentary documents from when it passed and iirc those questions were explicitly discussed. Also iirc (it was a couple of months ago when I checked), the phrasing in the EU regulation is totally different. Now of course the question is whether IB will spend money getting legal advice for just Swiss customers and try to provide investors with as much choice as then can or not take any risk, go the easy way and just prevent any non EU product from being traded. We will see in one year! In Bezug auf Ihre unten stehende Nachricht – für deren späte Beantwortung ich mich entschuldige – kann ich Ihnen mitteilen, dass es das neue Finanzdienstleistungsgesetz (FIDLEG), welches voraussichtlich am 1. Januar 2020 in Kraft treten wird, Schweizer Finanzdienstleistern grundsätzlich nicht verbietet, ihren Privatkunden US ETFs anzubieten. Sie haben ihren Kunden aber ein Basisinformationsblatt (BIB) abzugeben. Kein Basisinformationsblatt muss etwa dann zur Verfügung gestellt werden (ausser es besteht eins), wenn die Dienstleistung ausschliesslich in der Ausführung oder Übermittlung von Kundenaufträgen besteht – wenn Sie also Ihre Bank oder Ihren Broker ohne Beratung beauftragen, ein spezifisches Produkt zu kaufen. Insofern kann ich mir nicht vorstellen, dass es aufgrund der neuen Vorschriften zum BIB ab 2020 generell nicht mehr möglich sein wird, ein US ETF zu erwerben. Jedenfalls nicht aufgrund des Gesetzes. Wie aber die Praxis der einzelnen Finanzdienstleister aussehen wird, kann ich Ihnen leider auch nicht sagen. Ich hoffe, Sie können mit dieser Antwort trotzdem etwas anfangen. For those that don’t speak German: The answer from the legal services confirms what nabalzbhf already wrote. So my understanding it that with the introduction of FIDLEG Swiss Finance Providers (Brokers, Banks etc.) will also be required to provide a KIID. Which Vanguard does not provide for their US Products. BUT if the service offered is “execution-only” than the KIID (Basisinformationsblatt BIB in German) doesn’t need to be provided. So at least from a legal standpoint we should still be able to buy US ETFs, the other question is how brokers/banks will actually implement the rules. If they are lazy like DeGiro they might no longer offer any products without a KIID. Hey @Thaek, wow, thanks for getting such a professional answer to “our” question. I feel optimistic with that answer, that IB will not go the degiro path. Thanks Thaek. So BIB = KID (or KIID, both are not the same thing, though I don’t know which is which). From what this person wrote I take that it will generally not be forbidden, but brokers may just save themselves the trouble and disable these ETFs just to cover their asses. Then it would be up to us to push them te enable them. I am a silent follower of the forum, primarily due to being a newbie investor. Based on what I could learn here, I decided I should only stick to ETFs (given my limited knowledge) and should prefer Vanguard due to the lowest TER ratios in the market. I opened an account with DeGiro as it seemed the best choice for me - no commissions on ETFs, no balance requirement. Only charges I could see on my transaction history were the NYSE stock exchange connection fees & FX conversions. Now, with Degiro no longer supporting US based ETFs, what should be the best alternative for me ? Should I move to European ETFs or change the broker ? If so which is the next best broker for me ? I usually invest around 1000 CHF split across 3 ETFs each month and do not have the possibility to keep 100k in IB to avoid the 10 CHF per month. Appreciate your help and support. Thank you ! Thanks. So considering my requirement, even with the 10 chf monthly + other transaction costs, it is still the cheapest ? Also, why should i not leave my current positions in DeGiro. I can always sell them if needed and no custody charges or am i missing something ? The 10chf monthly include the transaction cost, you can look at it as free transaction credit that expires every month. btw: if you are under 25 it is just 3$ per month.